January Current Affairs. 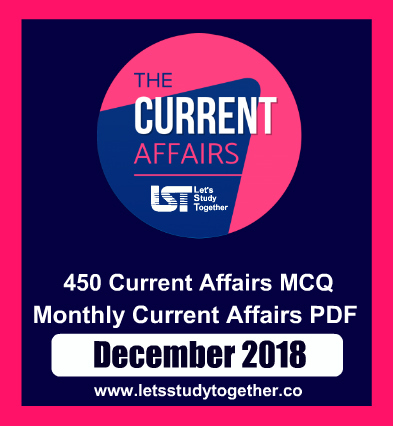 Important Current Affairs Questions – 25th January 2019. Daily Important Current Affairs. Daily Current Affairs PDF. Welcome to the www.letsstudytogether.co online Current Affairs section. If you are preparing for IBPS PO/Clerk, Canara Bank PO, banking & Insurance, SSC , Railways and other competitive exams, you will come across a section on the Current Affairs. Here we are providing you “Important G.K. & Current Affairs Questions “ in PDF format based on the current events for your daily practice. 1.InterGlobe Aviation Ltd, owner of domestic airline IndiGo, recently appointed _____________ as chief executive officer. Explanation: InterGlobe Aviation Ltd, owner of domestic airline IndiGo, appointed Ronojoy Dutta as chief executive officer for five years. Dutta takes over from Chairman and interim CEO Rahul Bhatia who was filling in after Aditya Ghosh’s departure last year. The company also approved the appointment of Meleveetil Damodaran as chairman. Both appointments are effective Jan. 24, InterGlobe was quoted as saying by Reuters. Dutta was President of United Airlines, where he worked for nearly twenty years, holding various senior leadership positions including senior Vice President (VP) Planning, senior VP Maintenance, VP Finance and VP Information technology. 2. _________ recently named Sultan Abdullah Ibni Sultan Ahmad Shah as the country’s 16th King. Explanation: Malaysia named Sultan Abdullah Ibni Sultan Ahmad Shah as the country’s 16th King. In a statement from the Keeper of the Ruler’s Seal, Sultan Abdullah will officially take over as King or Yang di-Pertuan Agong on January 31, replacing his predecessor Sultan Muhammad V of Kelantan state who resigned on January 6, reports Xinhua news agency. The 59-year-old Abdullah became Sultan of the Malaysian state of Pahang, succeeding his father Sultan Ahmad Shah, 88, who abdicated on January 11 due to ill health. 3. Reserve Bank of India (RBI), has recently approved __________ as the new Managing Director and Chief Executive Officer (CEO) of Yes Bank. Explanation: Reserve Bank of India (RBI), has approved Ravneet Gill as the new Managing Director and Chief Executive Officer (CEO) of Yes Bank. The board of directors of YES BANK have scheduled a special board meeting on January 29 and will finalise on the delegation of powers for transition management in the interim period commencing from February 1 until Ravneet Gill assumes office. 4.Air India Express will launch its first direct flight service from Surat to ______ on February 16. Explanation: Air India Express will launch its first direct flight service from Surat to Sharjah on February 16 and will also expand services from Gulf to Kannur in Kerala. The carrier, the international budget arm of Air India, will deploy Boeing 737-800 NG aircraft on this route. 5. National girl child day is celebrated every year on _________ as a national observance day for the girl child. Explanation: National girl child day is celebrated every year on 24th of January as a national observance day for the girl child. This celebration was started to offer more supports and new opportunities to the girls in the country. It is celebrated to increase the awareness among people about all the inequalities faced by the girl child in the society. Inequality about girl child is a vast problem which includes many areas like inequality in education, nutrition, legal rights, medical care, protection, honour, child marriage and so many. 6. Rashtriya Matdata Diwas is celebrated on _________ every year. Explanation: National Voters’ Day or Rashtriya Matdata Diwas is celebrated on January 25 every year. The significance of National Voters’ Day is to encourage more young voters to take part in the political process. It is a day to celebrate the right to vote and vibrant democracy of India. The day was first celebrated in 2011 to mark Election Commission’s Foundation Day. This will be eighth National Voters’ Day (NVD) and will be used to spread awareness among voters regarding effective participation in the electoral process. 7. ____________ has decided to constitute a special tiger protection force for protection of big cats in both its sanctuaries. Explanation: Telangana State government has decided to constitute a special tiger protection force for protection of big cats in both its sanctuaries. A meeting of the state level Forest Protection Committee under the chairmanship of the chief secretary S.K.Joshi has taken a decision towards this end on Tuesday. Accordingly, special forces will be constituted with 112 members, under the leadership of officers of the cadre of Assistant Conservators of Forest in both Amrabad and Kawal tiger reserves. Each team will have three range officers, 81 guards, and 26 forest watchers. Expenditure for maintenance of the teams will be distributed between Central and State governments in the ratio of 60:40. The committee has also stamped its approval on the proposal to release ₹2.25 crore for measures to prevent forest fires. It was also decided to prepare an integrated plan for protection of forests with coordination among various departments. 8._________ successfully tested the Arrow 3 missile system recently. Explanation: Israel successfully tested the Arrow 3 missile system, the Defense Ministry said. The Arrow 3 is meant to intercept ballistic missiles outside the atmosphere. The Arrow 3 is considered the next generation of defense systems, capable of attacking targets at from great distances and heights at a much higher speed. Today the Israeli army uses the Arrow 2, which has been operational for a few of years. It also uses an older version of the Arrow 3, given to the army in January 2017. The new system currently in testing will likely grant the army an ability to deal with more complex scenarios. 9. __________ has launched a new ecommerce platform for handloom, re-weave.in, aimed at helping weavers connect to the buyers, as part of the company’s philanthropic initiative, Project ReWeave. Explanation: Microsoft India has launched a new ecommerce platform for handloom, re-weave.in, aimed at helping weavers connect to the buyers, as part of the company’s philanthropic initiative, Project ReWeave. The platform hosts an array of handloom products created by the weaver communities, showcasing traditional designs and products created from natural dyes. Microsoft has been training weavers in the use of natural dyes to enable them to make newer and sustainable handwoven products, the company said in a statement. 10. Masazo Nonaka, the world’s oldest man has died in _______ at the age of 113. Explanation: The world’s oldest man has died in his sleep in Japan at the age of 113. Masazo Nonaka passed away peacefully at his home, a 106-year-old hot spring inn run by his family for four generations in Ashoro, Hokkaido, northern Japan. Mr Nonaka was born on July 25, 1905, the same year that Albert Enstein published his theory of relativity, and went on to live through countless landmarks in global history, including two world wars. 11. Maharloo Lake, sometimes seen in the news, is in which among the following countries? Explanation: Maharloo Lake also known as Daryache-ye-Namak is a seasonal salt lake in the highlands of the area of Shiraz, Iran. 27.0 km (16.8 mi) southeast of Shiraz, the lake salt is rich in potassium and other salts. 12. ________ recently successfully conducted training launch of the short range surface-to-surface ballistic missile “Nasr”. Explanation:Pakistan successfully conducted training launch of the short range surface-to-surface ballistic missile “Nasr”. The launch was aimed at enhancing the operational efficiency of Army Strategic Forces Command and to re-validate the missile’s desired technical parameters, the Army said. “Nasr is a high precision, shoot and scoot weapon system with the ability of in-flight maneuverability,” according to the Pakistan Army’s media wing, the Inter-Services Public Relations (ISPR). The strike range of Nasr is around 70-km. The weapon system has augmented full spectrum deterrence posture remaining within the precincts of policy of credible minimum deterrence, against prevailing and evolving threat spectrum more effectively including enemy’s ballistic missile defence and other air defence systems, the ISPR said in a statement. 13. ________ officially unveiled for the first time the 9M729 cruise missile of the Iskander-M operational-tactical missile system. Explanation: Within the framework of voluntary transparency, Russia officially unveiled for the first time the 9M729 cruise missile of the Iskander-M operational-tactical missile system in the presence of foreign defence attaches in Moscow. The attaches including two from India were also informed on the design of the sample and its performance characteristics. During the briefing, the self-propelled launcher in a ready position, the transport and launch container of the 9M729 product and the transport and launch container of the 9M728 cruise missile were on display. 14. A dedicated RPF Women Squad named as ‘JOYMATI BAHINI’ was recently launched in __________. Explanation: Assam, Railway Protection Force of Lumding Division has taken a significant step towards enhancing the security of women in the North East region. A dedicated RPF Women Squad named as ‘JOYMATI BAHINI’, comprising women sub-inspector and constables of the Railway Protection Force was formally launched today at Kamkhaya Railway Station in Guwahati. The main aim of the Joymati Bahini is to strengthen women security around Guwahati region within railway premises and trains. 15. __________ is now home to the world’s longest 3D-printed concrete bridge. Explanation: It’s 86 feet long and was created entirely with a 3D printer. Shanghai is now home to the world’s longest 3D-printed concrete bridge, produced by a team from the Tsinghua University School of Architecture in Beijing. The pedestrian crossing was modeled on the famed Zhaozhou Bridge, which was built between 589 and 618 in Hebei province, northern China, and is the country’s oldest standing bridge. That crossing was made from limestone slabs, while the new structure, found in Shanghai’s Baoshan district, was created using far more modern construction techniques.